The first generation Hyundai Veloster was an odd duck. Radical styling turned heads and introduced new buyers to the Hyundai brand, but its driving dynamics left a lot to be desired. And while enthusiasts hoped the 201-horsepower Turbo model would perform as its bodywork suggested, power and handling weren’t deserving of the “hot hatch” title. For the 2019 model year, Hyundai introduced a second generation Veloster with refined bodywork, suspension components, and features. Unlike its predecessor, the new Veloster Turbo (in R-Spec guise) could hang with its rivals in the corners and between stoplights. Still, we wanted more out of the funky three-door — and Hyundai is finally ready to hand over the goods. The 2019 Veloster N is the first U.S.-bound and second global market vehicle from Hyundai’s N Performance brand. Modeled after in-house tuners like BMW M and Audi Sport, N Performance optimizes the driving dynamics of select Hyundai models far better than aftermarket bolt-ons. To prove it’s serious, Hyundai established an N technical center adjacent to the famed Nurburgring, where the best performance brands thrash and tune their cars daily. Built to compete with Volkswagen’s Golf GTI ($27,310), Ford’s Focus ST ($26,045), and Honda’s Civic Type R ($35,595), the Veloster N will start under $28K (official pricing is TBD) and offer two stages of tune. Our first drive of the South Korean sports car takes us to Thunderhill Raceway in Willows, California. The 2019 Veloster N’s list of standard convenience features is solid, but lacks the upgradable content of its competitors. An 8.0-inch touchscreen infotainment system includes Apple CarPlay, Android Auto, and Bluetooth connectivity. Navigating the crisp, responsive display is painless and aided by a set of physical buttons and knobs below the screen. A TFT display between the tach and speedo shows media, vehicle speed, and telemetry information. Other highlights include an Infinity premium audio system, LED headlights and taillights, a backup camera, driver blind spot mirror, remote entry and push-button ignition, and automatic climate control. Those seeking leather seats, heated surfaces, a moonroof, and other niceties will have to check out the Veloster N’s rivals. Also missing are any active safety features; even common standards like automatic emergency braking and rear cross traffic alert are absent. Hyundai calls the Veloster N its “reverse halo” car. Unlike a typical halo model, which pushes the limits of a brand’s performance, price, and styling, the Veloster N is made to be attainable. Based upon one of Hyundai’s more affordable models and engineered for inexpensive upkeep, the Veloster N is an enthusiast’s dream. That is, of course, if it can back up its value proposition with driving engagement. 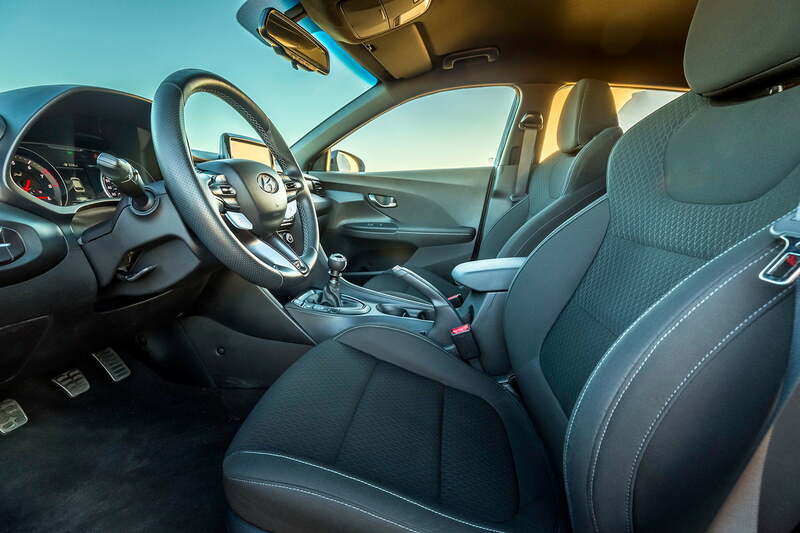 Those seeking leather seats and other niceties will have to check out the Veloster N’s rivals. Thunderhill Raceway Park is one of the most challenging road courses in America, with numerous blind curves, off-camber corners, and dramatic elevation changes. Albert Biermann, former head of BMW M, assures us the Veloster N is up to the task. Biermann has already left his mark on Hyundai’s sister brands, Kia and Genesis, having developed the Stinger GT and G70 sport sedans. To put the Veloster N on a level playing field with the Civic Type R, Biermann’s team left no critical performance piece untouched. The Veloster N utilizes a tuned version of the Sonata Turbo’s 2.0-liter turbocharged four-cylinder, producing 250 horsepower and 260 pound-feet of torque. Peak torque checks in at just 1,450 rpm and holds on until near the fuel cut-off at 6,750 rpm. A six-speed manual gearbox is the only transmission option and features a reinforced clutch, shorter shift throws, and clearer gate separation and gear engagement than the unit found in the Veloster Turbo. The powertrain is mounted on improved bushings that are stiffer, but still offer good NVH. Additional welding to the doors, side sills, roof, and hatch, stiffer front strut mounts, and better bracing increase torsional rigidity by 6.9% over the Veloster. 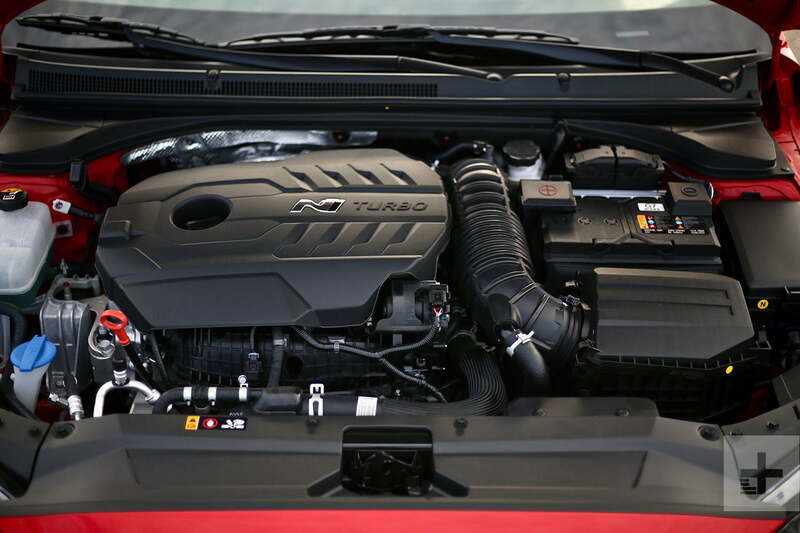 By switching from a column to rack-mounted power steering system, N Performance improves feedback. 13-inch front and 11.8-inch rear rotors match with single-piston floating calipers for a significant brake upgrade. Hyundai says it chose not to add a Brembo brake package to keep up front and replacement costs down. Continuously variable suspension dampers with five G sensors optimize ride quality regardless of driving scenario. Three ESC modes and a brake-based torque-vectoring system stay one step ahead of understeer and wheel slip. Standard Michelin Pilot Super Sport tires provide consistent grip for all your track day exploits. Above all else, the Veloster N is a hoot to drive — sharp and steady, sure, but overwhelmingly fun. All that’s just the standard performance kit. An optional performance package adds an electronic limited-slip differential, 19-inch wheels wrapped in specially developed Pirello P Zero tires, larger brakes, a variable exhaust system, and, most importantly, 25 additional horses from a re-tuned ECU (totaling 275 hp). Our Thunderhill test mules are peak N Performance spec, including a set of dealer-option sport brake pads. Of all modern era driving attributes, the toughest to get right is steering feel. Automakers add resistance to mimic the effort required for unassisted racks, but resistance doesn’t equate to feedback. Without a clear line of communication to the front tires, a driver can only rely on visual cues to sense a vehicle’s limits. Such guesswork isn’t necessary with the Veloster N. Though light, the N’s steering is perfectly weighted, communicative, and direct. Pointed into a corner, the hot hatch settles nicely and responds predictably to additional throttle or a dab of the brakes. Left in its Sport ESC mode and N drive mode, the tuned Veloster doesn’t cut power or yield to understeer when driven with finesse. Initial brake bite is strong and pedal feel is excellent. At high speeds down the front straight, the car is planted and comfortable. Rapid directional changes rattle the Veloster N’s composure a bit, but a half-second of patience lets us jump back to the throttle quickly to stay hot on the heels of Hyundai’s pro drivers. Working through the N’s six-speed gearbox is a pleasure, and though we choose to turn off the automatic rev-matching, those who haven’t mastered heel-toe downshifts will appreciate the smooth assistance. Power out of corners is plentiful and immediate, with zero signs of torque delay or torque steer. Above all else, the Veloster N is a hoot to drive — sharp and steady, sure, but overwhelmingly fun. To our eyes, the second generation Veloster is a vastly more handsome, upscale product than its predecessor. Still, some will miss the untamed exterior of the first gen — and that’s where N Performance steps up. While the old Veloster lacked power to back up its bodacious body, the Veloster N earns style to match its substance. While the old Veloster Turbo lacked the power to back up its bodacious body, the Veloster N earns style to match its substance. At the front, the N’s unique fascia includes a black gloss grille, chin splitter, LED headlights and daytime running lights, and air curtains to cool the front brakes. In profile, available 19-inch wheels and extended side skirts with air channels in front of the rear wheels distinguish the Veloster N. The rear view is the car’s most aggressive, with a double-decker roof-mounted spoiler, a bespoke lower fascia, and large dual exhaust ports. Red accents highlight the Veloster N’s lower aerodynamic elements. Hyundai will only sell the Veloster N in four colors: performance blue, chalk white, phantom black, and racing red. In red and blue, the hot hatch will appeal to younger enthusiasts, but black and chalk white should welcome mature buyers. Inside, the Veloster N takes the toned down directive a bit too far. Save for a few baby blue accents (the seat stitching, seat belts, gearshift knob, and steering wheel buttons), the cabin is a swath of black surfaces. The center stack has some stylized dimension, but cheap materials undermine the sense of quality. Cabin highlights include a thicker sport steering wheel, leather-wrapped gearshift, and well-bolstered sport seats. Hyundai makes claim to America’s best new vehicle warranty, offering five years or 60,000 miles of coverage, plus 10 years or 100,000 miles of powertrain protection. By comparison, Honda, Ford, and VW each offer just three years or 36,000 miles of new vehicle coverage. Keep in mind that wear and tear from tracking your hot hatch (be it Veloster N, GTI, Focus ST, or Type R) probably won’t be covered by the manufacturer. Hyundai is disadvantaged in the hot hatch segment, both for its relative inexperience and the impression created by the first generation Veloster Turbo. Thankfully, a review of the Veloster N’s specs opposite rivals should usher enthusiasts to Hyundai dealers for a fresh perspective. 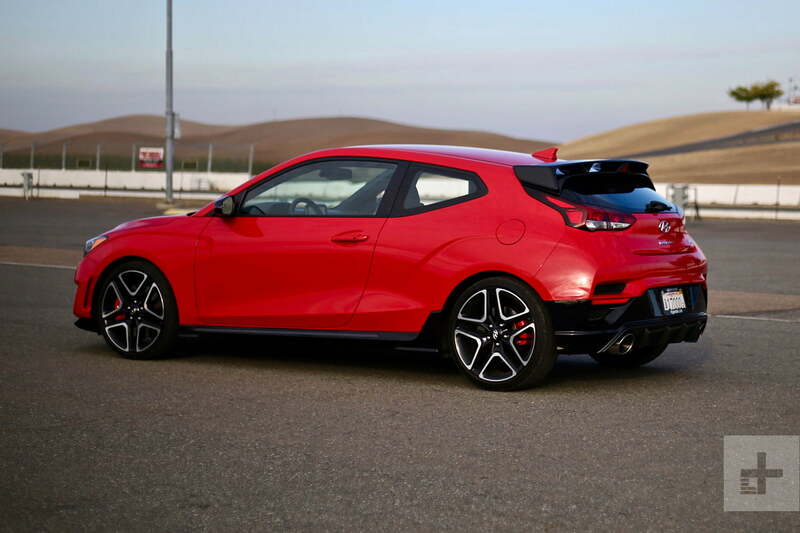 Among its front-drive foes, the Veloster N equipped with the performance pack touts the second most horsepower (only the Type R’ 306-hp rating trumps it) and lowest curb weight (just over 3,000 pounds). Combined fuel economy matches up against the Focus ST and Civic Type R, but is three mpg off the GTI’s 28-mpg figure. At a sub-$30,000 price including destination, the Veloster N performance pack slots neatly between the most affordable rival (Focus ST) and most expensive (Type R). With only one cost-add option, the 2019 Hyundai Veloster is pretty simple to configure. Our ideal spec wears chalk white paint and is equipped with the performance package. With the 2019 Veloster N, Hyundai has added a critical pillar to its U.S. market appeal. Over the last two decades, the South Korean automaker has improved vehicle quality and styling to compete directly with Japanese and American players. With the introduction of N Performance, the company can finally switch from defense to offense. Compelling, attainable performance products like the Veloster N will re-shape young customer opinions (the most important demographic for mainstream brands) like never before. For our part, we can’t wait to sink our teeth into more N Performance goodness.